So it says in the instruction book for this machine, which dates back almost 100 years. 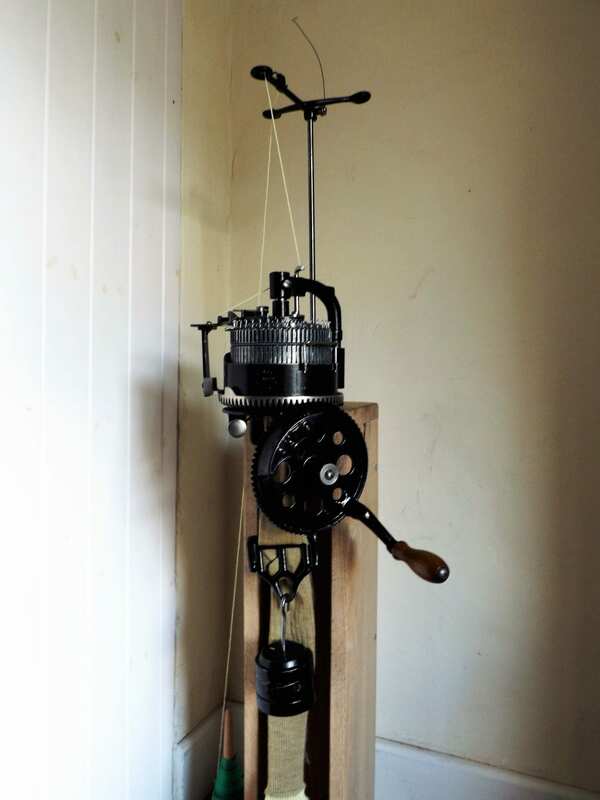 Sock Knitting Machines, or Circular Sock Machines (CSMs) were a Victorian invention. They were made by a number of companies in Britain and America and were popular for domestic use well into the 20th century, especially to make socks for troops during both world wars. They operate on the same principle as flat bed knitting machines, but work in the round. They clamp onto a table and you turn the handle to knit a tube (like a cross between a giant knitting nancy and one of those old mincing machines). Heels and toes are made by working backwards and forwards, taking stitches in and out of action as appropriate. Auto Knitter Hosiery Company, Limited was based in Montreal, Canada. For a time they were sold as a way to make extra money from home under their Work Contract. Standard Socks made with their ‘Olde Tyme’ Yarn to their specifications could be shipped back by the dozen. The cost of the machines are advertised at $80-94. Sadly there’s no price given for that ‘Olde Tyme’ yarn, or how much was paid for the completed socks. But presumably they were cost effective and the buyer also had the machine for their own home use. This particular machine was tracked down (in Minnesota) for sale on Ebay. It came complete with accessories, instruction book in its original wooden box. It now spends its time in Dorset, with occasional outings to markets and fairs, knitting up socks based on the patterns in that original intruction book using naturally dyed yarn.